Ecosystem services are the contributions that ecosystems provide to human well-being. They arise from the interaction of biotic and abiotic processes, and refer specifically to the ‘final’ outputs or products from ecological systems. Soil harbours a large proportion of Earth's biodiversity, and provides the physical substrate for most human activities. Although soils have been widely studied and classified in terms of physical and chemical characteristics, knowledge of soil biodiversity and functioning are still incomplete. Soil organisms are extremely diverse and contribute to a wide range of ecosystem services that are essential to the sustainable functioning of natural and managed ecosystems. Microbial communities (mainly composed by Bacteria, Archaea and microfungi) are vital to soil ecosystem functioning. This is because they exist in enormous numbers and have an immense cumulative mass and activity. Most of the phenomena observed in the visible aboveground world are steered directly or indirectly by species, interactions, or processes in the belowground soil. In particular, being microbial communities involved in nutrient cycling and organic matter degradation, they can affect biodiversity and productivity of aboveground ecosystems. Microorganisms can have stimulating or inhibiting effects on plants by the release of metabolites with a varying range of activities. Microbial communities are the main responsible of soil homeostatic capabilities removing contaminants and providing key ecosystem regulating and supporting services such as soil fertility, resilience and resistance to different stress. 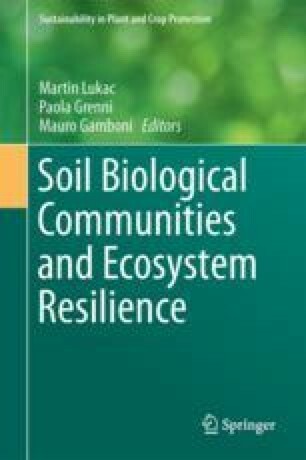 This chapter aims at describing the contributions provided by soil microbial communities to different ecosystem services and their potential use as indicators of ecosystem functioning. Understanding ecosystem functioning and predicting responses to global changes calls for much better knowledge than we have today about microbial processes and interactions, including those with plants in the rhizosphere. Ancona, V., Barra Caracciolo, A., Grenni, P., Di Lenola, M., Campanale, C., Calabrese, A., Uricchio, V.F., Mascolo, G., & Massacci, A. (2016). Plant-assisted bioremediation of a historically PCB and heavy metal-contaminated area in Southern Italy. New Biotechnology. doi:http://doi.org/10.1016/j.nbt.2016.09.006. CEC. (2006). Commission of the European Communities. COM(2006)231 final. Communication from the Commission to the Council, the European Parliament, the European Economic and Social Committee and the Committee of the Regions. In: Thematic strategy for soil protection (pp. 1–16). Brussels. Available at http://eur-lex.europa.eu/legal-content/EN/TXT/HTML/?uri=CELEX:52006DC0231&from=EN. Accessed April 2017. FAO and ITPS. 2015). Status of the World’s Soil Resources (SWSR). Main report. Food and Agriculture Organization of the United Nations and Intergovernmental Technical Panel on Soils, Rome, Italy, pp. 1–648. Available at http://www.fao.org/3/a-i5199e.pdf, Accessed April 2017. Haines-Young, R. (2016) Support to EEA tasks under the EU MAES process. Negotiated procedure No EEA/NSS/16/002. Report of Results of a Survey to Assess the Use of CICES, 2016 (Deliverable 2), pp. 1–22. Available at http://cices.eu/content/uploads/sites/8/2016/07/Report-on-Survey-Results_19072016_Upload.pdf, Accessed April 2017. MEA (2005). Millennium ecosystem assessment – Ecosystems and human well-being: Synthesis, pp. 1–155. Available at http://www.millenniumassessment.org/documents/document.356.aspx.pdf. Accessed April 2017. Nardo, M., Saisana, M., Saltelli, A., Tarantola, S., Hoffman, A., Giovannini, E. (2005). Handbook on constructing composite indicators (pp. 1–162). Paris: OECD Publishing. Available at https://www.oecd.org/std/42495745.pdf. Accessed April 2017. Orgiazzi, A., Bardgett, R. D., Barrios, E., Behan-Pelletier, V., Briones, M. J. I., Chotte, J.- L., De Deyn, G. B., Eggleton, P., Fierer, N., Fraser, T., Hedlund, K., Jeffery, S., Johnson, N. C., Jones, A., Kandeler, E., Kaneko, N., Lavelle, P., Lemanceau, P., Miko, L., Montanarella, L., Moreira, F. M. S., Ramirez, K. S., Scheu, S., Singh, B. K., Six, J., van der Putten, W. H., & Wall, D. H. (2016) Global soil biodiversity atlas. Luxembourg: Publications Office of the European Union. Available at http://esdac.jrc.ec.europa.eu/content/global-soil-biodiversity-atlas. Accessed Apr 2017. US EPA. (1999). United States Environmental Protection Agency. Use of monitored natural attenuation at superfund, RCRA corrective action, and underground storage of tank sites. In: US Environmental Protection, Office of solid waste and emergency response. OSWER Directive 9200, 4–17. Available at https://www.epa.gov/sites/production/files/2014-02/documents/d9200.4-17.pdf. Accessed April 2017. Walthall, C. L., Hatfield, J., Backlund, P., Lengnick, L., Marshall, E., Walsh, M., Adkins, S., Aillery, M., Ainsworth, E.A., Ammann, C., Anderson, C.J., Bartomeus, I., Baumgard, L.H., Booker, F., Bradley, B., Blumenthal, D.M., Bunce, J., Burkey, K., Dabney, S. M., Delgado, J. A., Dukes, J., Funk, A., Garrett, K., Glenn, M., Grantz, D. A., Goodrich, D., Hu, S., Izaurralde, R. C., Jones R. A. C., Kim, S- H., Leaky, A. D. B., Lewers, K., Mader, T. L., McClung, A., Morgan, J., Muth, D. J., Nearing, M., Oosterhuis, D. M., Ort, D., Parmesan, C., Pettigrew, W. T., Polley, W., Rader, R., Rice, C., Rivington, M., Rosskopf, E., Salas, W. A., Sollenberger, L. E., Srygley, R., Stöckle, C., Takle, E. S., Timlin, D., White, J. W., Winfree, R., Wright-Morton, L., & Ziska, L. H. (2012). Climate change and agriculture in the United States: Effects and adaptation. USDA Technical Bulletin 1935. Washington, DC, pp. 1–186. Available at https://www.usda.gov/oce/climate_change/effects_2012/CC%20and%20Agriculture%20Report%20(02-04-2013)b.pdf. Accessed Apr 2017.